I love putting together collaborative books. Coming up with an interesting topic and then gathering a group of fascinating people to share their stories and perspectives. The Adventure of an Ingenious Life: Follow Your Creativity Through Doors of Opportunity is filled with stories from some very cool people. Readers will learn from the experimentation and reinvention shared by eight authors, Traci Long DeForge, Robert David Duncan, Rebecca Ewing, Jodi Hersh, Vanessa Lowry, Ricia L. Maxie, Andrea Schlapia, and Renee Seals, along with more than forty additional contributors with diverse careers and interests. Each walked through a door—or several—to fashion the life they each have chosen. Nearly twenty years ago, I clipped an obituary eulogizing a woman I didn’t know. The headline described her, in her eighties, as an “adventurer.” That spurred my imagination to live life as an adventure—one where I followed my creative curiosity and personal passions to connect with intriguing people and to use my experiences as stepping stones. I believe life is filled with opportunities to choose. Whether your current road is one of ease or lined with difficulty, it will soon fork. You’ll have the chance to opt again. 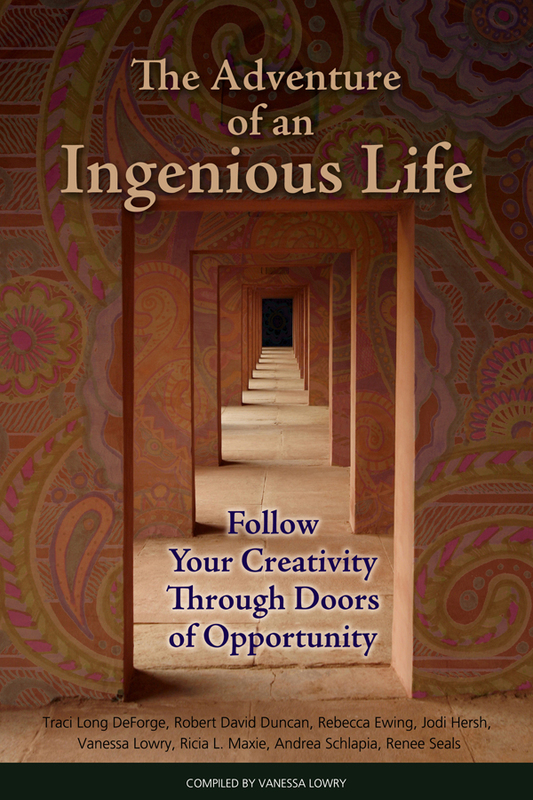 The book is dedicated to all who have chosen to live an ingenious life . . . and those who are just realizing they have the power to choose. 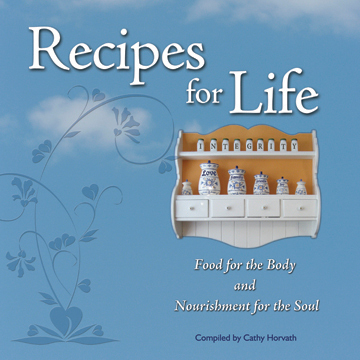 In addition to author and contributor stories, the book includes an extensive section of resources to inspire readers with listings of books, blogs, articles, podcasts, videos, and social media links. Buy your very own copy of The Adventure of an Ingenious Life here. It is fascinating how unexpectedly an idea for a book can emerge and evolve. Sometimes the idea comes from something we love so much that we feel compelled to share it. When I met David, he had already been through several rounds of editing and rewrites of his manuscript. I was honored to provide design expertise and offer advice through the final stages of publishing. On the Swing Thoughts acknowledgements page, David says, “Vanessa Lowry took the reins and brought Swing Thoughts to life with cover design, layout, production advice and contacts. Her job was literally to drag me over the goal-line. And she did that exceedingly well.” Who knew dragging someone over the goal-line could be so much fun?! Before the first copy of Swing Thoughts came off the presses, David was thinking of how to sell his book in bulk quantities of 10 to 100 to his contacts who might want to share with their family, friends, and clients. Check out how bulk quantities can be ordered directly on his book website with just a few clicks. The majority of the profits from the sale of Swing Thoughts are donated to ministries encouraging, empowering and restoring men. Find out more about David and read an excerpt of Swing Thoughts here. Publishing a book is becoming an increasingly popular way for business professionals to position themselves as an expert in a particular industry or niche. According to R.R. Bowker, the number of non-traditional titles published since 2002 has increased 8,460%! Publishing as a Marketing Strategy provides the reader with a practical guide for their own publishing journey along with stories of how other business professionals have used a published book as a successful marketing tool. I love collaborating with others so after envisioning this book concept, I invited collaborators Joan Boneberg, Bonnie Daneker, Robin Hensley, Ahmad Meradji, and Anita Paul to join me in sharing their personal stories of publishing and describing business benefits they have seen as a result. I also designed and formatted the interior of the book. Listen to the Write Here, Write Now interview where five of the co-authors talked about this book and the process of publishing in collaboration. Here is an article I wrote outlining 5 Whys and 10 How-Tos for publishing a collaborative book. If you would like to be part of a collaborative book project, contact me to see what book is in the works or to suggest a topic. 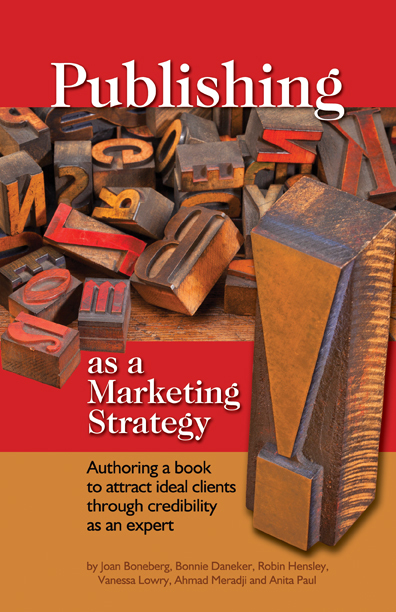 Publishing as a Marketing Strategy is available on Amazon, Barnes & Noble online, and through the Connect 4 Leverage bookstore. 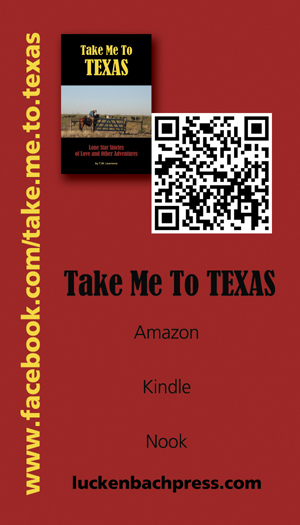 Also available in e-reader formats for Kindle, Nook, iPad. I’ve worked with Walter (aka TW) Lawrence on many projects and was thrilled he asked me to design his book cover for Take Me To TEXAS. 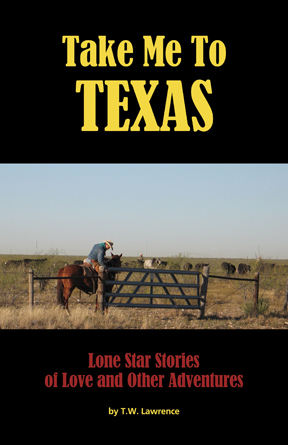 It is an anthology of short stories… all with a Texas theme. Although, one story takes place in my current town of Roswell, GA.
Walter has a great marketing mind and is promoting his book in interesting ways. He launched the book over Labor Day weekend at the Decatur Book Festival in Atlanta, the largest independent book festival in the United States. At the Decatur Book Festival, Walt was interviewed by Tim Morrison as part of the Write Here, Write Now radio remote. You can see how Walter took the audio and combined it with photos to make a YouTube video. Very smart! Walter had posters printed of the front cover art as another item he can sell along with his book. He also had shirts embroidered with the headline type of Take Me to TEXAS to wear when he is out promoting the book. He has developed a 20 minute business presentation on the topic of the importance of creativity in business to share with business professionals at groups such as Rotary. He is an alumni of Emory University and they are listing his book in their newsletter with other published alumni. Walt’s joining groups in Atlanta that have Texas roots to network with others who love all things Texan. The front of the card is just the book cover. This is the back of Walt's business card. Walt was my first client to use a QR code on his business card. He tells me many stories of how that creates a conversation with the people he meets while networking. He and two other fellow authors will have a booth at the Texas Book Festival in October 2011 representing the Atlanta Writers Club while each promoting their own newly published book. Walter is using this book to build an audience for his upcoming novel, Texas Cool Million. I guest host the radio show Write Here, Write Now once a month. Walt was my guest on August 9th when we talked about using the power of your network when writing, publishing and promoting a book. Walter’s interview starts at about 20 minutes into the show. It is fun for me to work with creative clients like Walter. We learn new things together. This books of quotes published by Myra McElhaney are straight out of MY childhood. And that is really the point. These quotes are familiar because MY Mama, YOUR Mama and MYRA’s Mama said them… or something very similar. I love working with Myra. She always makes collaborating fun and we laugh often. Myra has also started calling me her Gifted Graphic Design Goddess. I’m taking it a step further and adding the letters GGDG after my name. Vanessa Lowry, GGDG! In the past year, I’ve helped Myra publish Mama Always Says as well as her newest book, Musings on Major and Minor Matters that May or May Not Matter. 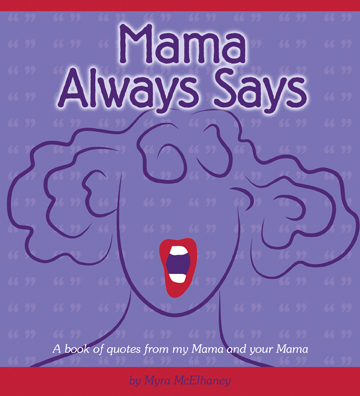 You can purchase your own copy of Mama Always Says from Amazon. 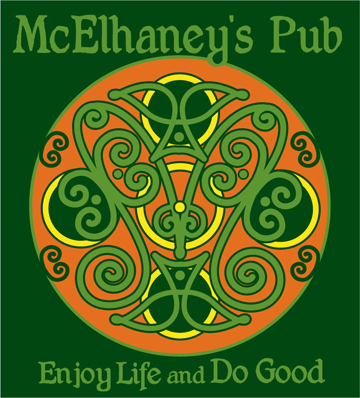 Myra and I also created a t-shirt commemorating McElhaney’s Pub. Myra’s husband, Phil McElhaney, died a few years ago as a result of a brain tumor. Proceeds from the sale of these t-shirts go to brain cancer research. You can contact Myra through her website and find out more about purchasing the t-shirts. Brent Brooks is a man of many talents including film director/producer and improv instructor. The Art of Suicide, winner of Best Underground film at INDIEfest in 2007, was produced by Blank Stage Productions and directed by Brent. Join Brent and other improv players every Monday night from 7pm – 9pm at Blank Stage in Marietta, GA for Improv Dojo … learn, laugh and have fun! Beginners are welcome. 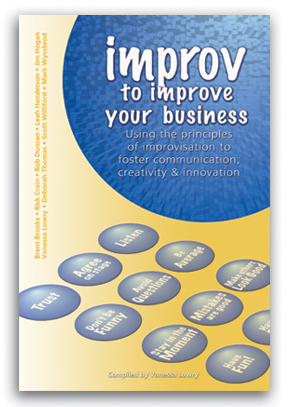 Here is a comment from Brent Brooks about working with me on our book, Improv to Improve Your Business. Other co-authors of this collaborative book include: Rick Crain, Rob Duncan, Leah Henderson, Jim Hogan, Deborah Thomas, Scott Williford, Mark Wyssbrod, Brent and myself. Have an idea for a collaborative book? I can help you bring it from concept to creation! Contact me at 678-521-8820. Find out more about me by visiting my LinkedIn profile or watching my video profile.